Attention all bird fans! Opening day is almost here and we have EVERYTHING you need to know before the game. The Orioles will be facing off against the Minnesota Twins on Thursday starting at 3:05 p.m. at Camden Yards! This year Orioles games will be airing on MASN, Baltimore's 105.7 The Fan, and the entire 45-station Orioles Radio Network. Pregame ceremonies will start around 2:30 p.m. To start out, Orioles players and coaches will be introduced and will run through the center field on an orange carpet. Manager Buck Showalter will also be introduced from the dugout! There will also be 100 kids from the Baltimore Orioles Reviving Baseball in Inner Cities Softball Program lining the orange carpet for players to run on. Lastly, one fan will be chosen to represent all Orioles fans as the teams '10th man'. That person will be introduced as part of the Orioles starting lineup! 60 previous Birdland Community Heroes will be welcomed back to Oriole Park to celebrate their contributions to the Birdland community. A $200,000 check will be presented to the group which will be evenly distributed among all of the Heroes' charities. The Orioles Charitable foundation also plans to add an additional $100,000 to this total! 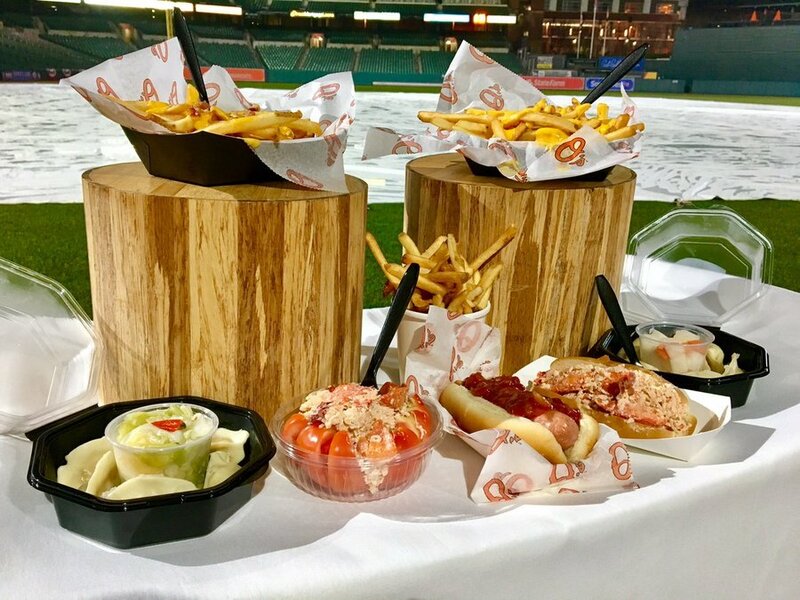 Click the below to see more pictures from Camden Yards! Richard Troxell, a native of Thurmont will be performing "The Star-Spangled Banner". Troxell has performed in the United States and abroad and he will also be singing "God Bless America" during the seventh-inning stretch. This will be his 12 performance of the National Anthem on Orioles Opening Day. During the anthem, a 30' by 42' American flag from Fort McHenry will fly over the batter's eye wall in center field. The flag is a replica of the one that flew over Fort McHenry when Francis Scott Key wrote the National Anthem. The Armed Forces Color Guard and the Baltimore City Fire Department Honor Guard will be showing their colors during the anthem. Weather permitting, the 104th Fighter Squadron of the Maryland National Guard will fly over Oriole Park at the end of the National Anthem. Longtime Orioles Head Athletic Trainer Richie Bancells will throw the ceremonial first pitch! Bancells retired in 2017 after 30 years as the head trainer and 41 years in the Orioles organization. He was inducted into the Maryland Athletic Trainers Hall of Dame in 2008. Fans are encouraged to use social media to share their Opening Day experiences. You can be featured on the Orioles Park video board by using #Birdland on Twitter and Instagram.